rodpedersen.com: OUT OF THE TUNNEL: VIVA LA MEXICO! OUT OF THE TUNNEL: VIVA LA MEXICO! When the calendar turns to another year and we are in the cold and freezing doldrums of January and February, many are thinking about a trip south with Mexico being top of mind. 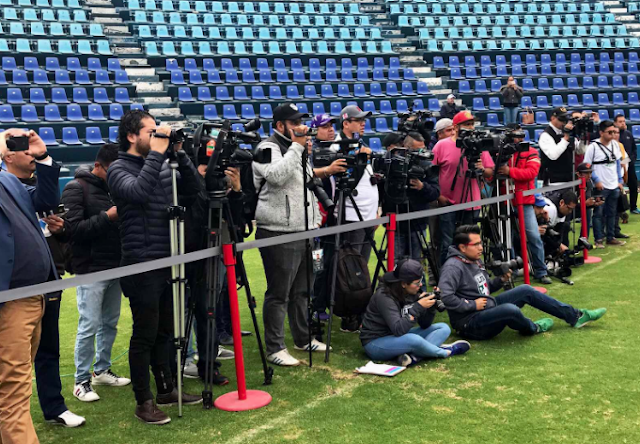 The CFL spent the second weekend of the new year under the warm Mexico City sun holding a tryout of Mexican players that were fresh out of college or playing in the Liga de Futbol Americano Profesional (LFA). This is a part of the next page of the CFL which is cultivating talent and growing the Canadian game on an international level and it begins with Mexico. Every CFL team was represented in Mexico City to put the players in attendance under a combine-like session. Many are panning the CFL spreading its wings into Mexico, but there is no real reason to thumb one’s nose at it because it’s something we don’t know. Let’s begin with the level of college football being played in Mexico. Much like USports, it’s around the mid-to-low level NCAA Division II level of play. How do we know that? Well an SB Nation report last January said the NCAA voted to open up Division II football to potential teams from Mexican universities. The NCAA is opening up Division II football because there is a lack of teams in the west. Any team that would attempt to play had better be ready for a rude awakening. Simon Fraser plays in the Great Northwest Conference and finally won their first game in four seasons and are 15-and-75 since joining the conference from CIS in 2010. Mexican high school also produces some decent players. One great example is UBC Thunderbird offensive tackle Diego Alatorre. He stepped off the high school fields of ITESM Guadalajara, Mexico and into the starting left tackle as a freshman with the TBirds in 2017 and hasn’t missed a start. There is talent, but no one really knows how much until they go toe-to-toe with CFL players at training camp. Better yet, allow teams to have full mini-camps to see if either the Mexican players or the league are wasting their time. All of this has to be hashed out in the upcoming CBA, but this can be nothing but good. There is nothing to lose and everything to gain. The CFL is also looking to Germany and other spots for international talent. The NFL already is a step ahead with their International Player Pathway Program. In 2018, eight players were on NFL practice rosters with Efe Obada (from the U.K. by way of the Netherlands and Nigeria) becoming the first player to play in an NFL game (though he was in a handful of NFL training camps before the international program began) from the program. Of the eight players, three are from Germany. Germany has been a hotbed of American football for many years with numerous Canadian college players making their way to Europe to play in the German Football League. Their love for football goes back to the old WLAF/NFL Europe. At one point they were able to support four teams with Frankfurt, Rhein and Hamburg all averaging more than 20-thousand fans per game. Frankfurt consistently drew on average 30-thousand fans a game. Right now, there may be more game-ready players in Germany than there are in Mexico. Three or four-down football is slowly growing across the globe and the CFL may be able to convert some of the top talent outside of North America. How the league will place these players on league rosters and how current CFL’ers welcome potential players that are guaranteed a spot will be very interesting. The cost is also interesting. With an operations cap being placed on CFL teams, it makes one wonder why the CFL and the teams are spending a lot of money to dig up potential players in a country not known for playing football. Would that money be better spent pounding the pavement for NCAA seniors not opting AAF or finding the next Bo Levi Mitchell (D1-AA), Mike Reilly (D2), Brandon Zylstra(D3) or any player playing a level lower than Division I in the NCAA? That’s up to the league to decide that. It was a good week at Mosaic Stadium. Chris Jones inked another one-year extension into the 2020 season with the Saskatchewan Roughriders. It looks like a win-win situation for both. If reports are correct and Jones has an out-clause to pursue NFL opportunities after 2019, this is good for his personal football future. For the Riders, this isn’t a long-term deal and gives the organization some wiggle room no matter what happens. If the season ends up in a Grey Cup, Jones will more than likely have more NFL teams looking to add his skillset to their organizations. Then the Riders will go on the search for his replacement. If the season goes south, then the organization isn’t on the hook for anything more than the final year of the contract. But the real interesting one is if the Riders win the Grey Cup and Jones wants a long-term extension. The Riders and Jones have agreed to one-year extensions each of the last two season and the negotiations will be very interesting if either are looking for more than a single season extension. If Jones wins 10 games in 2019, he would already climb into fifth (37 wins) on the all-time wins list with the Saskatchewan Roughriders. This is how successful Jones and his crew have been (or an indictment on how bad the Riders have been) in their first few seasons with the club. The only step remaining now is the Grey Cup. Mexico proximity being in North America with the US & Canada being the only 2 countries in the World that really have legitimate Gridiron Football & US & Canadian players that consider it a major pro sport. NFL Euro. Germany was THE one European Country that took to our Gridiron Football game. NFLEurope would be THE last minor / development league that the NFL supported. Instead using 10 player practice rosters per team. 320 players. With decent salaray of 100 thousand per player over 16 games as well as providing housing for players. As PR in the NFL are a revolving door with any team signing any player to a regular roster at any time. Rod I gota agree 1000%. Now its time to get the CBA done. Then Focus time and effort for a 10th team in Halifax. Im not sure if this is the blog post to comment on this. But here I go. Opposed to the CFL heading to Mexico or other Countries. As well as China who the Arena lleague has placed a gridiron football game in that country. Have each of those countries, & any others, to come to Canada & play the 3 down game in a schedule at a time to be determined. As well the thought of Canadian Players who have not made CFL rosters as well put the best rosters of said players to participate against these teams. Having them all on Canadian soil. What time of the year should said proposel be played would need to be discussed. If it is during this time of year. The only indoor football stadium in Canada is BC place at this point. However there are plenty of indoor facilities across canada that could host training camps. Should the CFL sponsor such a venture. It could possibily open up these said countries to broadcast these games within their said country. If all games & teams reside in the Vancouver area using facilties for practice and games at BC place it would streamline any travel costs. To take it a step further. Whenever the BiG O in Montreal gets its roof in place for the FIFA World cup. Quebec could also have its own team. Being that Gridiron Football is the most polular in that province with U sports players from Laval & other French Universities really having a ton of pro football players.